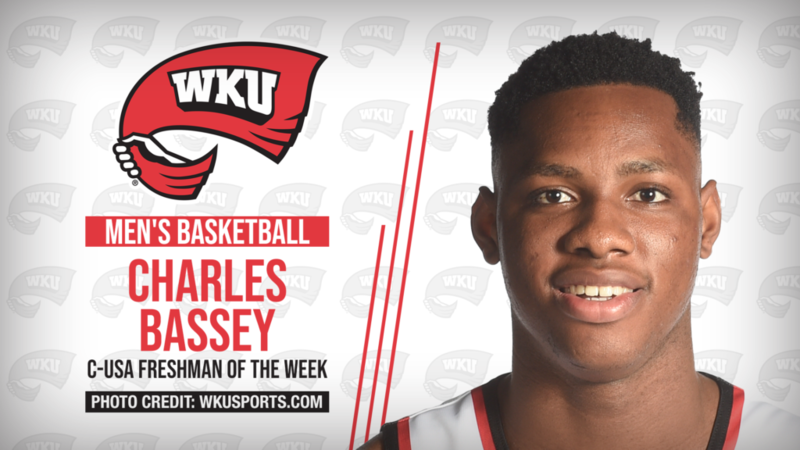 IRVING, Texas — After a strong week with three games in six days, WKU center Charles Bassey was named Conference USA Men’s Basketball Freshman of the Week on Monday. This is the fifth Freshman of the Week award this season for the 6-foot-11, 245-pound native of Lagos, Nigeria, and his first since Dec. 31. Bassey averaged 15.7 points and 14 rebounds in WKU’s three games last week, including two road contests. He began the week by pulling down 17 rebounds in consecutive wins over Marshall and at Southern Miss, making him 1 of 12 players nationally this season with multiple games of at least 17 rebounds. He’s also the first Hilltopper to grab at least 17 rebounds in back-to-back games since Chris Marcus in the 2000-01 campaign. Bassey tallied 17 points and 17 rebounds Monday in a huge 68-59 win over then-league-leading Marshall, then turned around and paced WKU three days later with 14 points and 17 boards in a narrow 66-63 win at Southern Miss on Thursday. His 17 rebounds in each game were the most by a Hilltopper freshman since freshmen became eligible to play varsity again in 1972. It was the most overall by a WKU player since 2010. On Saturday, Bassey led WKU with 16 points and eight rebounds in a loss at Louisiana Tech. He averaged 33 minutes during the week, shot 64.3 percent from the field, netted 11 of 12 free throws (91.7 percent) and grabbed 14 offensive rebounds.